A man is left to die in Alaska while on an “adventure vacation” and must somehow survive to get his revenge on those who betrayed him. Forty and facing a mid-life crisis, Stu Stark has lost his mojo. He simply gave up after being fired from his prestigious job as a prosecuting attorney for losing the biggest case of his career. So when Stu’s best friend gifts him a one-week trip into the Alaskan wilderness to rediscover his manhood, Stu thinks it just might do him some good. But after a horrible week, Stu is crushed when he realizes that no one is coming back for him. Dying, Stu is found by a grizzled old hunter who informs that winter has set in, and they’re not going anywhere for a while. So begins Stu’s training to become the man he never was…and to get revenge on those who betrayed him. This adult debut by the internationally bestselling YA author is a modern day take on The Count of Monte Cristo. 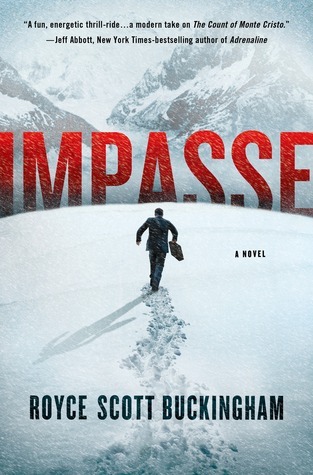 Impasse by Royce Scott Buckingham is a fast paced and enjoyable, modern day version of The Count of Monte Cristo. Though it does lack the long term planning that went into Count of Monte Cristo (Impasse took place over the course of six months), it was still an exciting read. It makes me wonder how soft I have become sitting behind a desk all day and wonder what would happen if I was forced to survive in the wilderness with nothing. I love a good revenge tale and the only real negative thing I have to say was how quickly (and neatly) things came together in the end. I would have enjoyed reading another 50 pages or so about what happened in the aftermath. That being said, I really enjoyed this book. Posted in Book Review, New Releases, Thriller. Tagged book review, thriller. I just started this and it pulled me right in. Enjoyed your review. Thanks for the reply and glad you enjoyed it!